I know you love dogs! How can we not? They love us, they trust us, they need us, and it’s so good to be needed, loved, and trusted! I’ve had dogs ever since I can remember and can’t imagine living without my furry best friend. But when I was in high school back in Nebraska, my best friend was a duck. He was a gorgeous mallard duck, with an iridescent teal neck, and his name was Roscoe. Every afternoon when I plodded home from school, Roscoe waddled down the dirt road, flapping his wings and quacking wildly, greeting me, welcoming me home. Until one day he didn’t. At the time, we were very poor and I had three always-hungry little brothers. My mother had to feed us. I did not eat dinner that night. I have never eaten duck since. 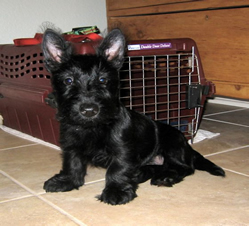 On a happier note, I’ll tell you about my Scotties! Scottie #1, Neva, was born in Leningrad USSR in 1990, and came home with me in a little carrying case on the plane. There was a small problem getting Neva (named for the river) out of the USSR even though I had all the paperwork in Russian, but we knew how to deal with that. Then tiny black Neva, age six weeks, flew over the Atlantic Ocean in the cockpit, sitting on the co-pilot’s lap (very briefly!). 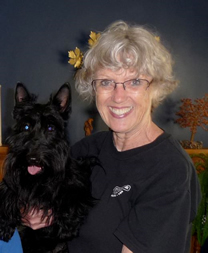 Scottie #2, Casey, was born in Arizona, and we brought her home at age two months. Casey became a literal life-saver, because one night she saved my husband’s life.